We like to have fun here at the Treasure Hunt Hub and ran with an idea given to us by one of our gaming store retailers who offers our papers to their customers. Below you'll find some fun props for all types of themed parties, treasure hunts or decorating! 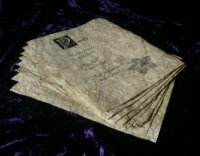 Dungeon Puzzles - Three different fantasy themed puzzles that can be easily incorporated into an RPG campaign or as clues left behind for a treasure hunt! Wizard's Potions - This set of eight potions, complete with instructions, are a great addition to your gaming or treasure hunt because this collection also includes individual ingredients sheets for every ingredient to make the potions! 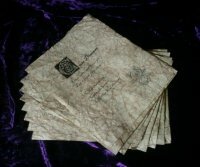 Wizard Spell Book Pages - Destruction Spells. This collection of eight different fun spells are a great prop for a wizard workshop or as loot in your next campaign! 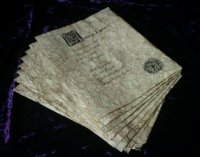 Wizard Spell Book Pages - Health Spells. Eight different fun spells that will boost your luck or health!